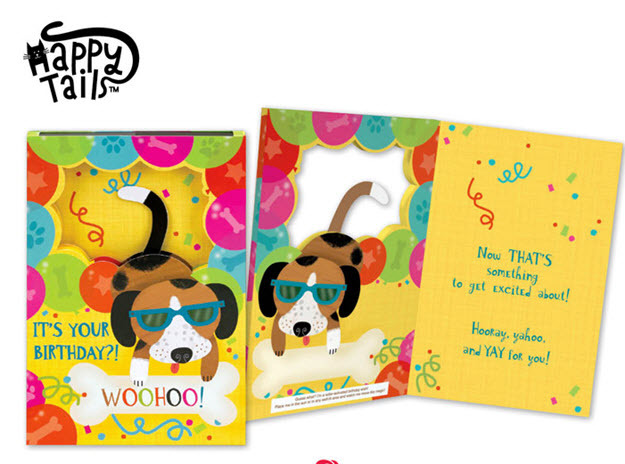 American Greeting has launched a new line of birthday cards called Happy Tails. The cards mark the first time the company has incorporated solar technology into its cards. The cards feature cute animals with tails that sway from side to side. The cards have a solar cell on top that helps keep the tails wagging without the need for batteries. Carol Miller, vice president of corporate innovation at American Greetings, says in the announcement, "Not only does the Happy Tails collection offer amusing animals and sincere messages, but the solar power is a dynamic new technology for greeting cards. This combination of excellent content and exciting innovation makes for memorable cards that will remind the recipient of their birthday fun long after the big day." The cards can be found at grocery stores, drug chains and other retailers as well as American Greetings and Carlton Cards retail stores.